The morning's journey into London was a little more testing than Saturday, what took 1.5 hours on Sat took around 3 on Sunday, due to engineering works. Were I a superstitious person I could have taken this to be a bad omen; since I'm not, I didn't. Sadly, it did mean that I missed the morning gathering which MIT Media Director Joi Ito and also included Brett Gaylor announcing the 1.0 release of Popcorn Maker, an awesome tool which makes it easy to remix and share web video and combine it with other web resources. Whilst en-route I tweeted out for help to contribute to my hackable game. After getting a wonderful coffee and losing a game of TurtleWushu to Lilly, one of the many brilliant baristas from Alchemy Coffee, I headed up to the hackable games area in order to plough on with my Thimble hackable game. Here I met one of the many lovely Mozilla folks, Chloe Varelidi who had seen my tweet and offered to produce some graphics for use in the game. 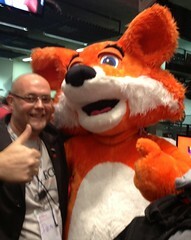 Over the course of the next few hours I also talked with and got help from one of the talented Mozilla coders 'Pomax'. Sadly, there was one too many problems with getting the game into Thimble by the end of the day, but I will contribute it as soon as they've ironed out a few last wrinkles. The Sunday programme was also full of interesting talks from a wide range of amazing people. For example, Alvaro Graves helped people get to grips with using linked open data to build visualisations using open source technologies. Many people are adding their slides and notes to the Lanyrd site, so even if you we unable to make it you can catch up on many of the sessions from both Saturday and Sunday. In the evening the science fair / demo camp returned and showed of many of the advances people had made with their projects. 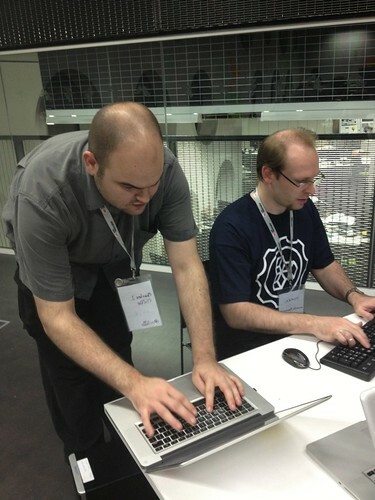 During this time I had an interesting chat with Christian, another great Mozilla chap. 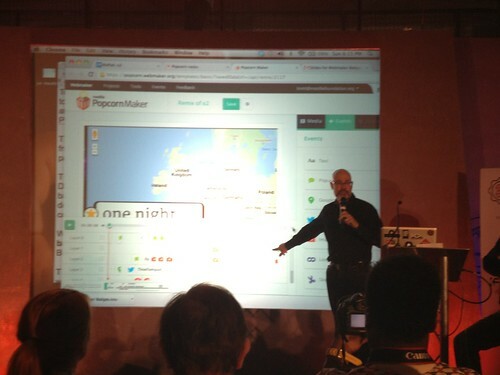 He's built a simple WebRTC camera which linked to a set of homemade buttons, connected via USB to control the camera operation. He also talked about how easy it is for web developers to become over-reliant on JS libraries and the knock-on effect of this, mobile apps that need to download many libraries to work. Most devs don't really experience the pain this can cause users, we develop locally and on high speed networks using powerful computers. We can sometimes forget that for many, reliable fast internet and high powered devices may not always be available.